UTech, Ja. Pharmacy — UTech, Ja. The Pharmacy is conveniently located on the ground of the College of Health Sciences building. It is a legally operated pharmacy, registered by the Pharmacy Council and managed by a registered pharmacist. The pharmacy boasts an up-to-date comprehensive computerized programme for the efficient processing of prescriptions. For your convenience, prescriptions may be dropped off before opening hours for collection later. To facilitate the learning process of third-year Pharmacy Students by providing them with hands-on experience. To provide pharmaceutical services to the UTech, Ja. and surrounding communities through the provision of safe and effective medications. Emphasis is also placed on counseling patients on proper drug use and appropriate lifestyle changes for the control and prevention of diseases. Opening hours: Mondays to Fridays 8:00 a.m. - 8:00 p.m.
UTech staff members receive 10% discount on prescriptions with or without Health Card. 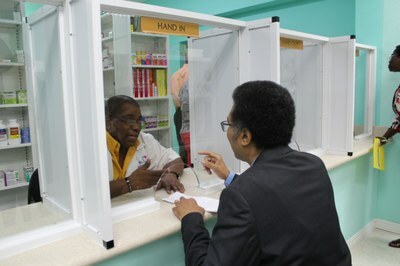 Students are also given discount on prescriptions filled without the use of a health insurance card. Student ID must be presented and the discount is only applicable to prescriptions written for the respective student. A wide range of prescription drugs, non-prescription drugs, toiletries, first-aid supplies, and more.